Faculty, please submit this information form to Jesse Mashbaum, CAHSS Business Manager, when you submit a small external grant application. Excellent grant writing resources here. Fulbright webinars are archived here. Sunday, February 10th at 4:00p.m. Want to be part of the action? Deep Vision Dance Company seeks vibrant, intelligent, versatile dancers with a collaborative spirit for their 2019 performance season. Dancers receive rehearsal and performance honorariums. Rehearsals take place on Sundays (4-9pm) and Mondays (6:15-9:30pm). Click here for more information and to apply. Deadline: February 11th at 5:00 P.M. The Baltimore Film Office at the Baltimore Office of Promotion & The Arts (BOPA) is now accepting entries for the 14th annual Baltimore Screenwriters Competition. Applicants can submit screenplays in the feature or shorts categories. The top entries in both categories win cash prizes, and feature winners also receive all access passes to the 2019 Maryland Film Festival and passes to local movie theaters. The deadline for submissions is Monday, February 11 by 5pm. Click here to apply. The 2019 Stone Quarry: Artist-in-Residence program (SQ:AIR) is ideal for artists seeking to surround themselves in an inspiring natural landscape and the rolling hills of idyllic Central New York. Our founder, artist Dorothy Riester, created Stone Quarry Art Park to provide inspiration and support for artists through our program. Artists may be at any point in their artistic career, including self-taught, emerging artists or artists from underrepresented demographics. We accept artists of most creative mediums. * Four artists will be selected each year in March and will arrive at the Art Park as a cohort in July. Click here for more information and to apply. Maryland Traditions Project Grants support short-term research and programming focused on folklife, or living cultural traditions. Successful Project Grants fund the project-based activities of professionals, community scholars, organizations, and artists as they identify, document, support, and present Maryland folklife. Past Project Grants have supported performances, festivals, oral histories, filmmaking, fieldwork, and other activities focusing on folklife. For more information, contact an MSAC staff member using the information in the Project Grant application. To access the application and review grant guidelines, click here. The Baltimore Museum of Art (BMA) announces the inaugural cycle of the Meyerhoff-Becker Curatorial Fellowship, a year-long residency program, based in Baltimore, Maryland. The selected fellow will receive a full-time residency, round-trip travel expenses, and a $40,000 USD salary with benefits. Applicants who come from groups historically underrepresented in the museum field are strongly encouraged to apply. The Fellowship will act as a career catalyst, providing a singular experience in exhibition making for emerging professionals. The Fellow will work closely with Dorothy Wagner Wallis Director Christopher Bedford to realize the inaugural Robert E. Meyerhoff and Rheda Becker Biennial Commission, which invites internationally-renowned contemporary artists to make transformative works of art for the BMA’s most accessible public spaces. Click here for information and to apply. Lighthouse Works’ primary focus is an artist-in-residence fellowship program that seeks to support those working in the vanguard of their creative fields. Fellowships are six weeks in length and provide room and board, studio space and $1,500 in stipends. Artists at any stage of their career are encouraged to apply for a fellowship through our online application system. Applicants are required to fill out an application form, submit work samples and attach a CV and current work statement. Applicants are encouraged to read completely the guidelines found under the “Before You Apply” section of our website. Click here for more information and to apply. The Maryland Arts Summit will be presented by and for the Maryland arts sector and will be held June 7 and 8, 2019, at UMBC. We welcome artists, arts administrators, arts advocates, arts educators and teaching artists, and other interested parties to consider leading a session, presenting their work, and sharing their stories with the community. The MAP Fund invests in artistic production as the critical foundation of imagining – and ultimately co-creating – a more equitable and vibrant society. MAP awards $1 million annually to up to 40 projects in the range of $10,000 – $45,000 per grant. MAP supports original live performance projects that embody a spirit of deep inquiry, particularly works created by artists who question, disrupt, complicate, and challenge inherited notions of social and cultural hierarchy across the United States. Funded projects address these concerns through the processes of creating and distributing live performance to the public, and/or through the content and themes of the work itself. MAP is committed to intersectional anti-racism, and does not support cultural appropriation or oppressive project language, structures, or content. Applications open December 3rd. Click here for full application details and requirements. The Flute Choir Composition Competition is for composers who write original works for flute choir/flute orchestra. Compositions may be a maximum of twelve minutes and must include a minimum of six parts, including any combination of instrumentation of piccolo, C flute, alto flute, bass flute, and optional contrabass flute. At a minimum, the composition must include parts for C flute, alto flute and bass flute. For more information and to apply, click here. New: Close Space Open Place – Open Call for Dancers, Choreographers, and Performers. “Close Space Open Place” is an invitation to think together, to discover together what space is, through the whole body intelligence as a meditation in movement observing, interpreting, sensing, feeling, acting it. It is a projection mapping art installation which will fill, give life and dynamic form to the space of public architectures through meditating, communicative bodies. The body’s movement and gestures become the language to pursue a shared research about our presence and actions in the world. Click here for more information and to apply. ADF’s Movies by Movers invites short dance films by students and professionals for our 2019 season! Films will be screened at the American Dance Festival during its annual summer festival in Durham, NC, and on the campus of Appalachian State University in Boone, NC. Additionally, films may be selected to be screened on campuses across the United States through the Institutional Partnership Program. Click here for more information and to apply. ADF’s Movies by Movers invites short dance films by students and professionals for our 2019 season! Films will be screened at the American Dance Festival during its annual summer festival in Durham, NC, and on the campus of Appalachian State University in Boone, NC. Additionally, films may be selected to be screened on campuses across the United States through the Institutional Partnership Program. This year, in addition to our general submissions for student and professional projects there are two new categories. The animation category invites professional dance films which feature stop motion, rotoscope, digital animation, and other forms of animation. The Underrepresented Directors/Choreographers category invites professional dance films whose leadership team includes artists from groups underrepresented in dance film and the arts more broadly; people of color; people in the LGBTQ community, people with disabilities, people of various shapes and sizes, and more. Artists are invited to self-identify here. For more information and to submit, click here. BWAC seeks skill in the use of material and art that demonstrates the importance of conserving our limited natural resources. We are looking for how well the medium relates to the upcycling movement and how fully the artist’s intention or concept is presented and realized. The juror’s awards will reflect that artistic judgment. The fifth RECYCLE show by BWAC will be mounted in our unique gallery – a massive Civil War-era warehouse on the Red Hook waterfront in Brooklyn, NY. This enormous space affords us the opportunity to exhibit really huge work, and we welcome it! Click here for more information and to apply. ARIE 2019 is calling for artists, curators, researchers to apply for a one to three months residency at the A4 Art Museum in Chengdu, China. We provide a round-trip plane ticket, accommodations, studio, material fees, different kinds of salons and sharing sessions and other opportunities depend on different project and cities (Chengdu, Yokohama, Bangkok); selected artists will be equipped with a program assistant and be professionally supported by the staff of the museum. Throughout the residence, artists will have the opportunities to attend assorted activities and put on a final exhibition to end this unique residency program that helps artists dive into the local social fabrics and urban spaces. For further information, and to apply, click here. We invite submissions from a wide range of disciplines including (but not limited to): Human-Computer Interaction, Psychology, Dance, Artificial Intelligence, Neuroscience, Sports Science, Machine Learning, Cognitive Science, Visual Arts, Robotics, Philosophy, Anthropology, Music, Affective Computing, Games, Healthcare and Animation. Click here for information and to apply. The MOCO 2019 theme will be Movement Imaginaries. Paper presentations, panels, performances, demos, workshops on all MOCO-related topics are welcome. MOCO is an interdisciplinary conference that explores the use of computational technology to support and understand human movement practice, as well as movement as a means of interacting with computers. We welcome submissions with an interdisciplinary understanding of the movement that ranges from biomechanics to embodied cognition and the phenomenology of bodily experience and identities. We, therefore, invite submissions from a wide range of disciplines including, but not limited to Human-Computer Interaction, Psychology, Dance, Artificial Intelligence, Neuroscience, Sports Science, Machine Learning, Cognitive Science, Visual Arts, Robotics, Philosophy, Anthropology, Music, Affective Computing, Games, Healthcare and Animation. Click here for more information and to apply. Contact Millennium Composers at mcicomposers@gmail.com or click here for further information and details. Composers 30-years-old or younger are invited to submit an orchestral score for consideration for the 2019 Cabrillo Festival Composers Workshop, July 27 thru 31. Led by Maestro Cristian Macelaru, the Cabrillo Conductors/Composers Workshop brings together leading faculty, the award-winning Cabrillo Festival Orchestra, and early career conductors and composers for a professional training program which focuses on the creation and performance of new music. The five-day program is held in downtown Santa Cruz, California, and involves 3 selected composers, 6 fellows, 6 associates, and 8 auditing conductors. Selected composers will have their work conducted by participating conductors, under the direction of Cristian Macelaru, and performed by members of the Cabrillo Festival Orchestra. Three dedicated rehearsals will take place, culminating with an “In the Works” concert where each piece will receive two or three performances. Composers will receive recordings from the final concert. Composition faculty, Kristin Kuster, will offer guidance and seminars throughout, other Festival composers-in-residence (to be announced) will participate, and direct feedback will be offered from the players and conductors. Composers are invited to submit ONE score only, recording on CD (MIDI versions are acceptable), and a resume to be submitted via Slideroom no later than March 1, 2019. Materials must be sent digitally, as specified below. After reviewing the details outlined below, if you have any questions or wish to discuss the program in greater detail, please feel free to contact Lyndsey Loosley, Director of Artistic Operations of the Cabrillo Festival at 831.426.6966 or via email at lyndsey@cabrillomusic.org. COMPOSERS are required to submit the following to arrive no later than MARCH 1, 2019: 1. ONE short curriculum vitae 2. ONE score which you believe might fit the project along with a recording, OR a score representative of your work (w/ recording) if you intend to compose a new piece for the program. (Selected composers will be required to submit final scores and parts to arrive no later than June 10, 2019.). Digital submissions here. Click here for additional information. We are currently seeking proposals from artists and sites for ARTsites 2019, a one-year outdoor sculpture exhibit on display from August 2019 to July 2020. Selected artists will be awarded a $2,500 grant to participate in the exhibit. Complete guidelines and submission information are available here. For the 2019 season, the Millennium Chamber Symphony is reviewing chamber works by contemporary composers who are women; in any combination of violin, cello, clarinet, piano (including piano 4 hands). Selected works will be presented in the MCS program season in NYC and venues beyond, and composer(s) will receive a $250 USD honorarium. Please send your MP3’s and any PDF’s to millenniumcsymphony@gmail.com by March 1, 2019. Click here for further information. Mid Atlantic Tours provides fee support grants to presenting organizations in Delaware, the District of Columbia, Maryland, New Jersey, New York, Pennsylvania, the U.S. Virgin Islands, Virginia, and West Virginia booking the current roster artists for engagements taking place between July 1, 2019 and June 30, For full booking and program guidelines, please download the 2019-2020 Booking Guidelines. Engagements must be confirmed no later than March 1, 2019. There is no application process involved for Mid Atlantic Tours, but funds are limited, and fee support grants are available on a first-come, first-served basis. Presenters are encouraged to pursue this opportunity and secure artist engagements as soon as possible. The Valley City State University Gallery of Art is actively considering submissions and proposals for exhibitions from artists and curators. We will consider proposals for solo or group exhibitions in all media. Preference will be given to proposals that are conceptually stimulating and challenging for the student body as well as the community in general. Click here for information and to apply. Poets will be selected for the 2019 programs by the National Parks Arts Foundation and the Poetry Foundation, with consultation by the Gettysburg Foundation. Candidate’s proposal for using the artist-in-residence period to produce literary art that open-mindedly conveys a response to this place and landscape. Application fee: $35. Resident artists will receive a $1,000 stipend. Click here for more information and to apply. The Minnesota Orchestra Composer Institute offers a unique week-long intensive immersion into the world of a major American symphony orchestra culminating in a concert performance and live broadcast on Minnesota Public Radio. Under the guidance of Pulitzer Prize-winning composer and Institute Director, Kevin Puts, up to seven composers will have orchestral works rehearsed and performed by the Minnesota Orchestra and will participate in a series of seminars on musical, career, and professional development topics in collaboration with the American Composers Forum. All works selected for the Institute will be performed in a public concert conducted by Music Director Osmo Vänskä on Friday, January 10, 2020, 8 pm. Click here for more information and to apply. Creative Alliance is accepting applications for its live/work studio Residency Program beginning in Summer 2019. This long-term program, founded in 2003, is open to artists of all media who would like to deepen their practice in a supportive, dynamic environment, and interact with colleagues who thrive in a lively cross-cultural, multi-disciplinary live/work environment. The Residency Program provides a highly visible, intense and creative environment for the production of artwork in all media. Attracting artists from around Baltimore, nationally, and internationally, the program is located on the second floor of The Creative Alliance in Highlandtown, Baltimore’s most diverse neighborhoods. A rarity in the field of artist residencies, Creative Alliance’s long-term program has a lease commitment from a minimum of 1 to a maximum of 3 years. The International Sculpture Center (ISC), is seeking panel proposals for the 29th International Sculpture Conference in Portland, OR this October 12-15, 2019. This conference will feature the annual ISC littleSCULPTURE show, ARTSlams and breakout sessions, engaging panel discussions, evening parties, hands-on workshops, a keynote address, open studios and gallery hops, optional art and culture trips, public art tours and visits to nearby sculpture sites, and more. Click here for information and to apply. Please reach us at the webpage for the full rules. CRS is announcing this Competition for the benefit of your constituents, for the following CD recording opportunities. The Award of first prize will consist of $1,500 and a commercially distributed compact disc, featuring all contestants’ favorite composers’ chamber works, also including solo piano works. The Award of first prize will consist of a commercially distributed recording, with production expenses paid by CRS for a new compact disc featuring one composition along with other distinguished composers’ chamber works including piano. Click here for additional information. USArtists International supports performances by U.S. artists at important cultural festivals and arts marketplaces around the globe. Committed to the presence of U.S. based artists on world stages, USArtists International provides grants to ensembles and individual performers in dance, music and theatre invited to perform at significant international festivals and performing arts markets. USAI encourages and promotes the vibrant diversity of U.S. artists and creative expression in the performing arts by expanding opportunity and exposure to international audiences, encouraging international cultural exchange and enhancing the creative and professional development of U.S. based artists by providing connections with presenters, curators and artists around the world. USAI extends the reach and impact of professional touring artists and ensembles from the United States and is committed to expanded touring opportunities for continued sustainability of U.S. artists. USAI provides grants of up to $15,000 towards support of artist fees, travel, accommodations, per diem, shipping and visa preparation. Fiscal Sponsorship required. Click here for further information and application instructions. Chamber Music America’s Classical Commissioning Program provides grants to professional U.S.-based presenters and ensembles whose programming includes Western European and/or non-Western classical and contemporary music. Grants are provided for the commissioning and performance of new works by American composers. The program supports works scored for 2-10 musicians performing one per part, composed in any of the musical styles associated with contemporary classical music. Click here for information and to apply. Kulturfactory Performing Art Residency hosts seven times a year for one week artists from everywhere in this amazing place just close to Naples Pompei Vesuvio. Kulturfactory is a great opportunity to be in a contemporary environment and to stay in one of the most creative areas in the world. Kulturscio’k is a not-for-profit company dedicated to producing, discovering, supporting international contemporary artists working in performance, new forms, art, music, film, literature, architecture, theater, fashion and other creative disciplines and fostering opportunities for multi-disciplinary dialogue. Innovation and development of new forms. The element of collaboration and exchange is one of the founding principals of the company and factory-residency is a new way to host artists, with the hope that by bringing together different areas of practice, we will generate new creative outlooks, unparalleled research and exciting new impulses. Click here for application instructions, or here for the full prospectus. The purpose of the Creativity Grant Program is to strengthen the vitality and sustainability of artists and small organizations to maintain a strong and stable arts infrastructure in the State of Maryland. The Creativity Grant also provides opportunities to serve the growing needs of relevant arts projects and collaborations within Maryland communities. Applicants may only submit one application per fiscal year (July 1 – June 30). The Creativity Grant Program supports eligible activities of Independent Artists and Small Organizations with grants ranging from $1,000 to $3,500. Click here for more information and to apply. The mission of the Andrew S. Way Music Foundation is to nurture the relationships between composer, performer, and listener by providing educational opportunities that will challenge and inspire musicians to create and be part of new music. The Andrew S. Way Music Foundation is committed to the composition, education, and performance of new music. The process by which this is achieved has two major components: first the grant selects composers to write new music (for a school or organization), then music educators apply for the opportunity to perform the music with their ensembles in live concert. When the two are matched, the foundation will also help facilitate and encourage communication between the composer, the educator, and the ensemble. Currently accepting all applicants from the Bay Area. The Andrew S. Way Foundation welcomes composer and school/organization applicants from all walks of life and musical paths, and is dedicated to supporting all types of music. Click here to apply. Artist, designer, researcher and creator of all disciplines are invited to apply for Tentacles AIR program. This program is for creator who aims to develop new body of works, conduct research or experiment and focus on their practices. Located in the heart of Bangkok, 2 minutes from Tentacles Art Space and art community “N22” Tentacles Residency aims to support cultural exchange, research and experiment project from local and international art practitioners. Click here for additional informationa dn here for the application form. The Doug Davis Composition and Performance Endowment is dedicated to support and honor the performers and creators of music. The intention is that this endowment will financially support the performers of a specified musical composition each year, a reward for the focus of their talent. With the assistance of the California State University Bakersfield music faculty, this endowment will also award commissions to create new compositions. For more information, click here. The Maryland Film Office (MFO) has announced that applications for tax credits for MD Small Films will be accepted on a first-come, first-served basis beginning at 9 am on November 19. A film production entity may be entitled to a refundable tax credit against the State of Maryland (State) income tax for certain costs incurred in the State that are necessary to carry out a film production activity in the State. The Department of Commerce is limited to certifying $800,000 in tax credits for all Maryland Small Film applicants in FY 2019 (July 1, 2018 – June 30, 2019). Click here for more information and to apply. The three-week Artist in Residence program (AIR) of the Rockville Art Department augments the studio arts curriculum by providing students with direct hands-on experience in the arts that is guided by visiting artists. This is accomplished by: (1) Enabling students to work with contemporary artists other than faculty, (2) Fostering a vested commitment between artist, student and the educational setting of the College, and (3) Enhancing the Department’s curriculum. We are seeking individuals or groups with a wide range of artistic practices outside the traditional studio arts foundation curriculum. Proposals should offer a mutually supportive creative learning environment between students, classes, and Artist. Each artist is provided with a $2000 stipend for transportation, installation of work, and compensation for time. Click here to download the application. Created in 1993 to further FCA’s mission to encourage, sponsor, and promote work of a contemporary, experimental nature, Emergency Grants provide urgent funding for visual and performing artists who have sudden, unanticipated opportunities to present their work to the public when there is insufficient time to seek other sources of funding; or, incur unexpected or unbudgeted expenses for projects close to completion with committed exhibition or performance dates. Each month FCA receives an average of 80 Emergency Grant applications and makes approximately 12-15 grants. Grants range in amount from $500 to $2,500, and the average grant is $1,500. For more information or to apply, click here. The Eyebeam Center for the Future of Journalism (ECFJ) is an experimental grant-making program that supports artists producing innovative and revelatory journalistic work for major media outlets. Underwritten by Craig Newmark Philanthropies, ECFJ is the first initiative of its kind to directly facilitate artists’ major media commissions in the realm of journalism. With the belief that artists are central in the invention and design of our shared future, and also critical in shifting public debate, ECFJ supports the execution of pieces that focus on reimagining the way stories are told, particularly around technology and society. The funds distributed to artists assist with research, travel, and other expenses many media outlets struggle to cover, allowing stories that are often out of reach in today’s climate to be produced. Read the full press release here. The Ynot Lot is an outdoor event venue located on the corner of North Avenue and Charles Street in the heart of the Station North Arts & Entertainment District. 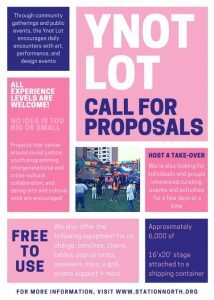 Through community gatherings and public events, the Ynot Lot encourages daily encounters with art, performance, and design events that are created by a range of local and national cultural organizers. We encourage projects that center around social justice, intergenerational and cross-cultural collaboration, daring arts and cultural work, and youth-run or youth-oriented events. For more information and to apply, click here. Fledgling has an open rolling application process for grants to support outreach and engagement for social issue documentary film projects that have the potential to inspire positive social change around issues that affect the most vulnerable. Applicants can submit online at any time and will be asked to include a description of the project, its social change goals and plans for moving the project forward. Typically, film projects have at least a rough cut. Proposals are reviewed on a rolling basis and appicants will be notified of decisions within three months. Grants typically range from $10K – $25K. Fledgling supports audience engagement planning and implementation. For more information and to apply, click here. The Hamilton Arts Collective (HAC) and the Hamilton Gallery seek applications from artists for month-long Guest Artist exhibitions at Hamilton Gallery located at 5502 Harford Road, Baltimore, MD. The selected guest artists will be invited to exhibit a selection of their current work in Gallery I of the Hamilton Gallery. The Guest Artist exhibition is featured in Hamilton Gallery communications and will be promoted by the HAC and Hamilton Gallery. This is an open call to artists residing within 60 miles of Baltimore City. Baltimore residents are encouraged to apply.